Let the metal onslaught continue! There was no doubt in my mind that Living Sacrifice’s eighth full-legnth, Ghost Thief, was going to be anything but great. Since Reborn, the band has done nothing but release great metal record after metal record. And since reforming, the band’s focus and commitment to creating quality metal records has been evident. Ghost Thief picks up where The Infinite Order left off, and then destroys it. Ghost Thief is faster and more aggressive than the band’s last couple of albums, without losing the grooves and intricacies we’ve come to expect from Living Sacrifice. Screwtape is the most “metalcore” I’ve ever heard Living Sacrifice. The song is riff filled and the riffs carry through every structure of the song. And Ryan Clark (Demon Hunter) lending his vocals to the hook really help drive the song. It’s still a great thrash metal song and no one will be comparing Living Sacrifice and Attack Attack based on this track. Ghost Thief and The Reaping are classic Living Sacrifice songs, both sound like they could have been written around the same time The Infinite Order was written. The riff the drives Straw Man is super melodic and is something I don’t think I’ve ever heard Living Sacrifice do. (Yes, Perfect was a super melodic song, but the riff on Straw Man is way more melodic than Perfect, even if the song is heavier at times). American Made has a great opening riff that reminds me of classic Tourniquet songs. The breakdown and change of timing halfway through the track is fantastic. Lance’s drumming on Before is amazing and really creates a heavier layer under the song. Despair is old school, classic, thrash, Living Sacrifice. Everything about the song sounds like an updated version of the band’s self-titled debut. Ghost Thief is one of this year’s best record. Living Sacrifice makes great records. 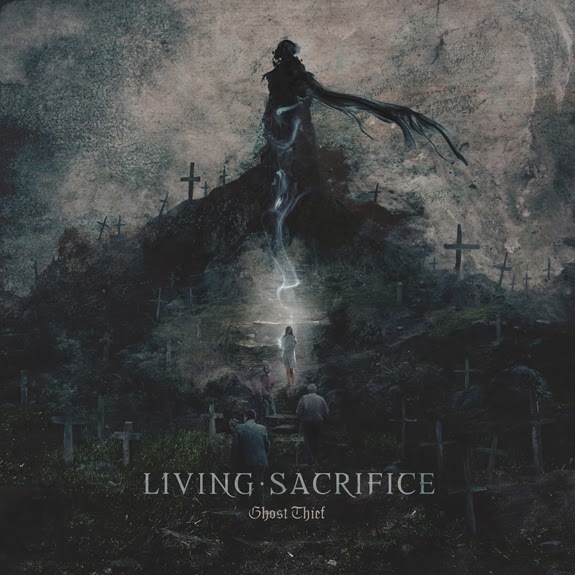 And if their status as metal legends was in jeopardy, Ghost Thief will expel all doubts and will firmly cement Living Sacrifice as one of metal’s best!